for the perfect surface texture. The work is often mistaken for oil paintings but I use only Bullseye brand glass powder on sheet glass. Wall pieces are mounted on an aluminum backing and adhered with a high quality marine silicone and hang with a simple gallery wire. The work is extremely durable and light fast even in brightest sunlight and never weighs more than twenty pounds. 20 x 26 x 1.5"
Based on a summer trip to Colorado’s Estes Park, this piece comments on the life as well as nature. Events come together, change occurs. Life continues. Like all my work, this piece is made entirely of glass using my signature technique in which I mix Bullseye glass powder with water, apply to sheet glass with traditional painting tools and kiln fire several times to achieve the perfect combination of color and surface texture. Because it’s all glass, it will not sun fade even in the harshest light. Mounted on a hidden backing of aluminum and hangs easily with a gallery wire. 18 x 18 x 1.5"
This piece is reminiscent of my college years in Northern Idaho. It's a much damper climate with thick woods made up of Lodge Pole Pine, Cedar and the showy Tamaracks. This recalls mushroom foraging trips after fall rains. The center part of the piece was created using my Palette Knife technique but on a clear panel of class instead of the opal normally used. It was also taken to a full fuse for a glossy texture. Then it was fired on top of a cream opal piece of glass that was dusted with glass powder before firing and so it appears to have a textured border or matte around it much like a watercolor painting. This creates an incredible depth that is difficult to photograph. This piece began with a story about a young couple who went to the farmer's market and bought lemons. Then something happened. What was it? The lemons remain untouched on the weathered wood table. Is he coming back or walking away? A change of location can profoundly affect an artist's work. In 2015 my husband and I made a very big move.... from the Midwest to the Arizona Desert. For me, it was a sense of homecoming. I grew up in Southern Idaho where the land was relatively flat and surrounded by mountains. And, I've never liked the cold. I love the almost constant sunshine, the subtle but sure changing seasons. I'm exciting by the stormy monsoons. I love the colors, the sunsets and the amazingly rich history. I'm discovering a new relationship with the land. 19 x 23 x 1.5"
Like all my work, this piece is made entirely of glass using my signature technique in which I mix Bullseye glass powder with water, apply to sheet glass with traditional painting tools and kiln fire several times to achieve the perfect combination of color and surface texture. Because it's all glass, it will not sun fade even in the harshest light. Mounted on a hidden backing of aluminum and hangs easily with a gallery wire. 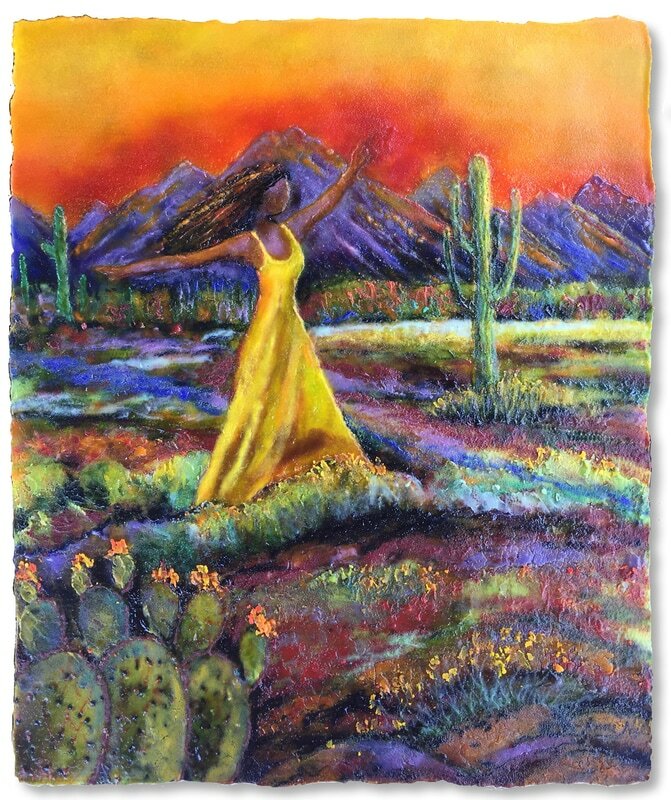 20.5 x 16 x 1.5"
A purely imagined scene that embraces the color and joy of the desert created using my signature palette knife glass technique and fired to a matte finish. 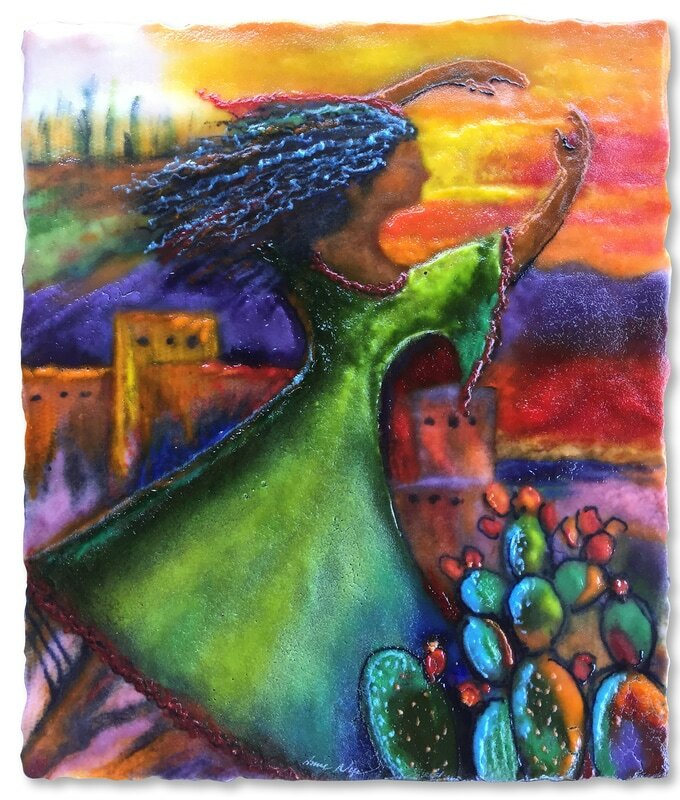 17 x 20 x 1.5"
Wind Dancer is the first of a series I'm developing about the women of the Southwest. As in most areas, much was and is done by the women. The stories of the Hohokum, an ancient Pueblo People who once inhabited this area prompted this piece. It came out of a dream complete with title. It was created using my signature palette knife glass technique and is fired to a satin texture. 20 x 16 x 1.5"
This piece is for me the essence of the desert. It's not any particular place, just a sense of place manifested in glass. The intense light coming through a dust storm at sunset sets the land on fire with color. In my imagination I am riding a paint pony through it, heading home. It was created using my newest technique: Water Color Glass. Thin layers of watered down glass powder applied with a brush on a pre-fired textured panel of sheet glass and fired to a matte texture. 18 x 28 x 1.5"
but fell in love with it regardless. This piece was inspired by that very prickliness. I love the desert Agave cactus and the impressions they leave on each new leaf that opens, similar to the impression the desert leaves on those who live here. Edges and impressions, part of desert life. They are made entirely of glass using my signature technique in which I mix Bullseye glass powder with water, apply to sheet glass with traditional painting tools and kiln fire several times to achieve the perfect combination of color and surface texture. 21.5 x 27 x 1.5"
The Casa Grande Ruins National Monument in Coolidge Arizona is a crumbling, yet sacred, space that housed the Hohokum people dating back to the 1300's. The images and presence of this place have haunted me since I first moved here to Arizona..
GEO CACHE One of a Kind Kiln Glass Wall Panel SALE $600 18 x 14"